Sony's PS4 Pro is a 4K HDR PlayStation, sort of | What Hi-Fi? Sony's new addition to the PS4 family is official. The PS4 Pro is geared towards 4K and features HDR support. It launches 10th November and will cost £349. The PS4 Pro can upscale games to 4K resolution but stops short of being able to handle native 4K games. However, the PS4 Pro can handle any HDR (High Dynamic Range) content which features in upcoming game releases. Which flavours of HDR content the console can accommodate remains to be seen. It's been confirmed that Sony's new console can't play 4K Ultra HD Blu-rays, which puts it at a significant disadvantage when compared to the Xbox One S. It seems very strange for Sony to leave this feature out given Sony's support for the original format. 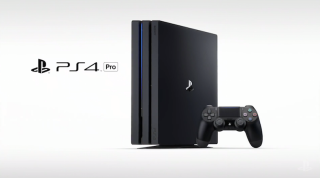 4K streaming services are supported by the PS4 Pro - a new Netflix app will be available for the PS4 Pro at launch, while Sony is in talks with YouTube to develop a 4K-supporting app for the console. There's no word on whether Amazon Video's 4K service will be supported at launch. The console itself shares some design traits of the original, such as the slanted exterior, but the new model features a new triple-layered design, a 1TB hard drive and a more powerful graphics processor. The Dual Shock controller has been tweaked too, with light from the light bar now running in a strip along the top edge of the touchpad. In other news, every standard PS4 will be made HDR-compatible via a firmware update which will be made available next week. The original PlayStation 4 couldn't stream 4K video, so this should theoretically only come into play with compatible games. There's also a slimmer version of the PS4 launching 15th September. The trimmed down version of the console features the same hardware as big brother and will cost £259. MORE: PS4 vs Xbox One - which is best?